I probably should have inserted some sort of joke here about drinking vodka to reduce the stress of making macarons, but it’s actually for your paint! It’s the perfect solvent for your gel food coloring. It evaporates when it dries and leaves no taste or unwanted color behind. 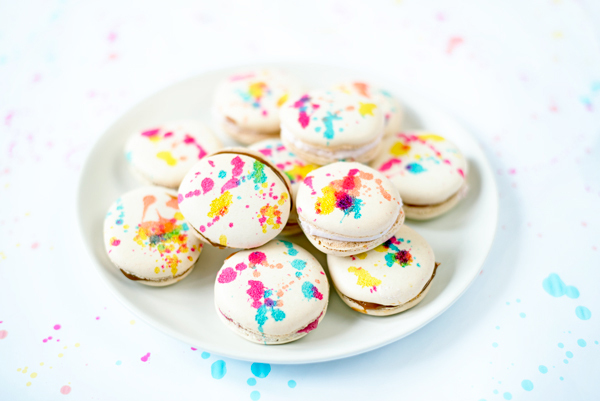 You don’t need to make your own macarons to paint them though. 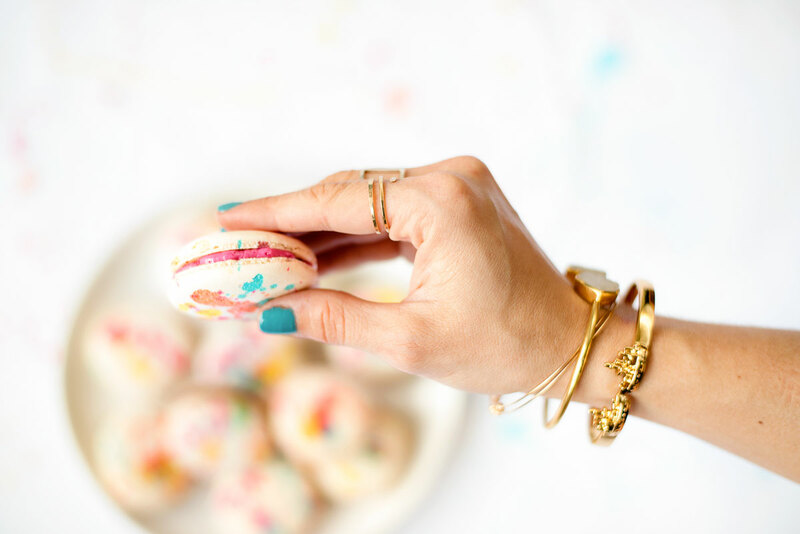 You can start with store-bought macarons – I won’t tell! 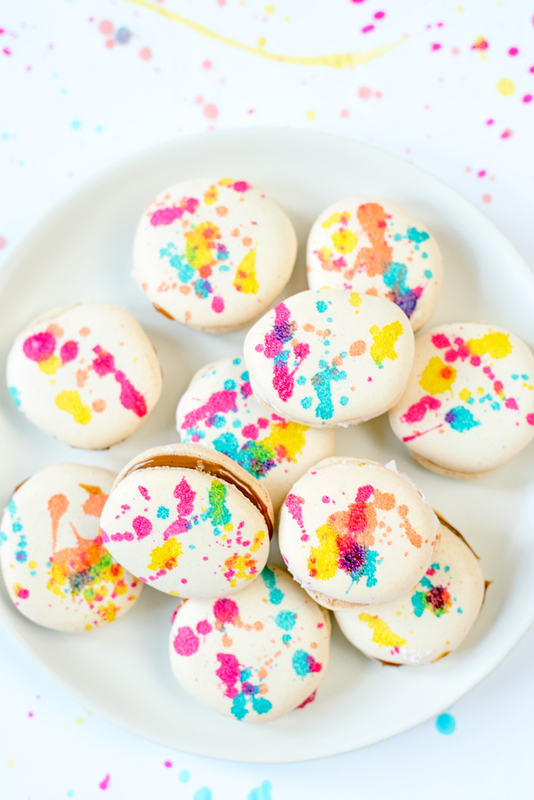 They are also a great way to disguise a less-than-perfect batch of macarons like the ones in these photos. My poor shells don’t have much in the way of feet for this batch, but a little paint makes them awesome! 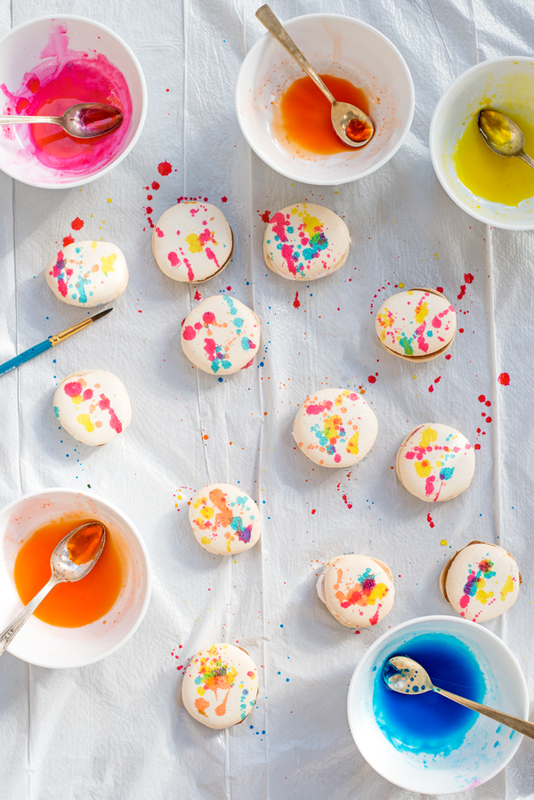 For a more comprehensive guide to working with food paint, check out this post. It also has some ideas for other things to do with food paint! 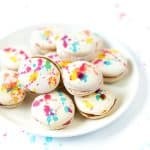 This is really too much excitement for one post, so I’m going to leave you with the recipe we used for the plain macaron shells from Annie’s Eats. I also shared recipes for the strawberry buttercream and blackberry ganache fillings in this post. 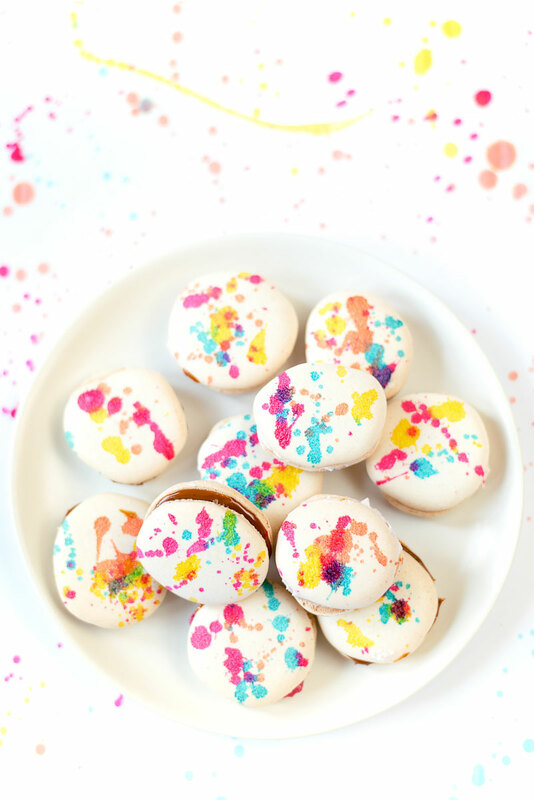 Use edible food paint to make these adorable splatter-painted French Macarons! 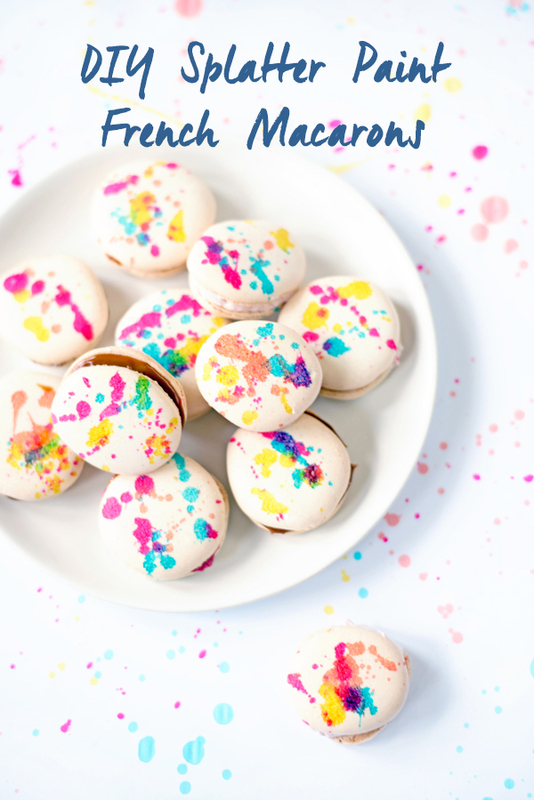 Plus, a recipe for plain french macaron shells. Note, this recipe calls for a kitchen scale. Since the batter is very delicate, it’s important to measure everything precisely – even the egg whites! Line baking sheets with parchment paper. Tip: for more uniform circles, use a cookie cutter or other circular object about the size of a 50 cent piece to trace out circles on the back side of the paper. You can also find printable templates free online. In a large bowl, combine the almond flour and confectioners’ sugar. To ensure it is lump free, sift the mixture through a medium-mesh sieve. 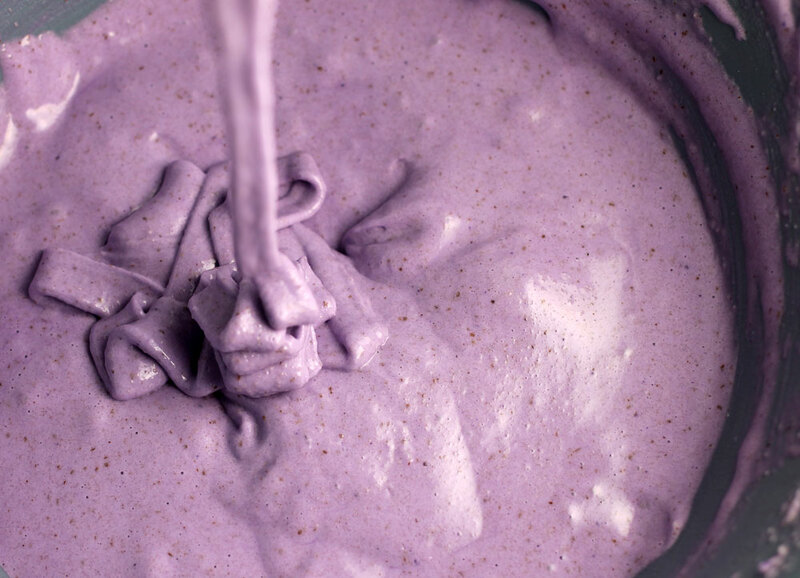 Make a well in the center of the dry ingredients and pour in 82 grams of the egg whites. Use a spatula to blend the egg whites into the dry ingredients until evenly combined with a paste-like consistency. In a small saucepan on medium-high heat, heat the sugar and water. Stir continuously until the temperature is around 200° Fahrenheit on a candy thermometer. Keeping the sugar water mixture on the heat, combine the 90-gram portion of egg whites with a pinch of sugar in the bowl of a stand mixer. Beat on medium-low speed until foamy soft peaks form. Heat the sugar water mixture to 248° Fahrenheit. If soft peaks happen before the syrup reaches 248° Fahrenheit temperature, reduce the speed to low to keep the whites moving. Once the syrup reaches 248° Fahrenheit (it may take a while, but it will get there! ), immediately remove from heat. Increase the mixer speed to medium and pour the syrup down the side of the bowl in a slow drizzle until fully incorporated. Increase the mixer speed to high and whip the meringue until stiff, glossy peaks form about 8 minutes. Use a spatula to gently fold one-third of the meringue mixture into the almond mixture. In three more additions, gently fold in the remaining meringue. You may not need all of the meringue, so gradually at it in. The perfect consistency will be smooth and run off the spatula in thick ribbons (photo here). Add the batter to a pastry bag fitted with an extra large round piping tip. Hold the bag perpendicular to the baking sheet about 1/2-inch above the surface of the pan. Steadily pipe rounds about 11/4- to 1 1/2-inches in diameter into the circles you traced. Hit the sheets on a counter 4-5 times in order to reduce bubbles. This creates quite a lot of noise but it is worth it not to have holes in your macarons. Set the sheets aside to settle for about 20 mins until a film begins to form around the outside. Preheat the oven to 350° Fahrenheit and place a rack in the middle of the oven. Transfer the baking sheet to the oven and immediately reduce the temperature to 325° Fahrenheit. Bake for 9-12 minutes, until the tops are smooth and set and “feet” have formed around the bottom. This was one of the first batches of macarons we made and unfortunately, they weren’t perfect. Feet are very challenging to get. I read a few articles and there are a myriad of reasons why you can’t get feet: your batter is too dry, too wet, didn’t allow them to rest enough, the oven was too hot, too cold etc. The good news is, they’ll still taste delicious! So my advice is to be grateful for the feet you do get and keep on trying. Let the shells cool for 5-10 minutes on the baking sheet and then peel away from the parchment. They should come away easily using your hands and fully intact. Transfer to a cooling rack. Protect your surface with a garbage bag or large sheet of paper. Wear old clothes you don’t mind getting stained. Doing this outside is ideal. To make your ‘paint’, mix a pea-sized amount of gel coloring with about a teaspoon of vodka or extract. The liquid should evaporate and not affect the final flavor of your macarons. Careful, as this will stain your hands and could stain the bowls used. 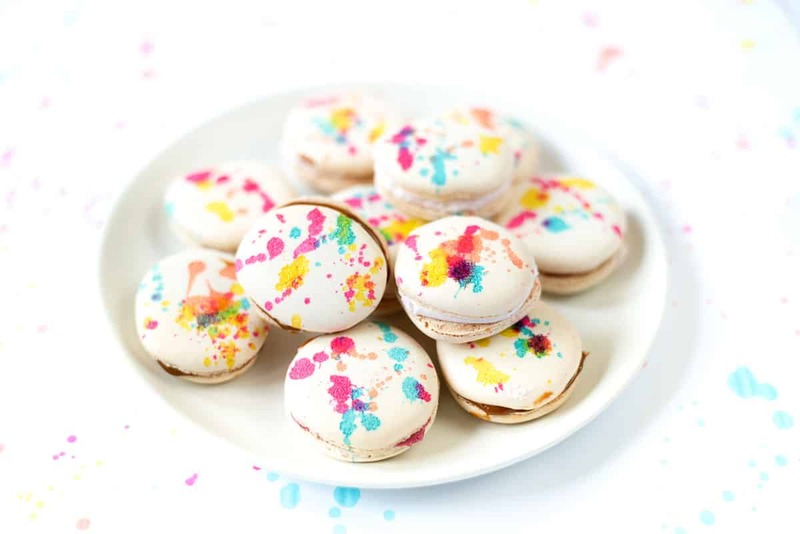 “Splatter” the paint on your macarons by dabbing your brush in the gel coloring mixture, holding the brush between your thumb and middle finger and tapping the brush with your second finger. You can vary the vigor of your taps to create differently sized splatters. Originally from Thomas Keller’s Bouchon cookbook, found via Annie’s Eats with notes by me! Need more color in your life? 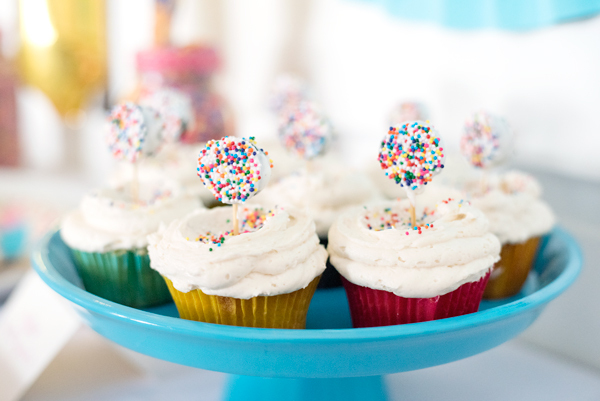 Check out these colorful DIY cake platters made from thrift store finds! I just saw these on food gawker and I just had to come see your beautiful creation up close. What a great idea! 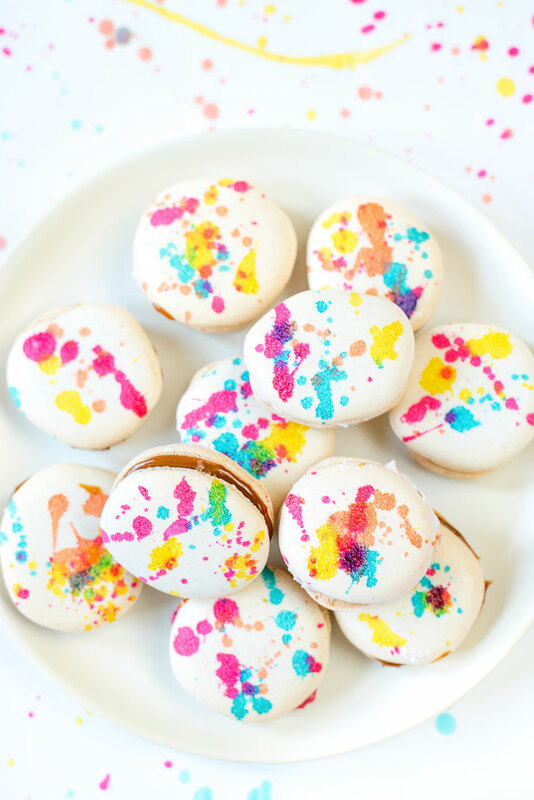 They are beautiful, fun, and look delicious. Great work. 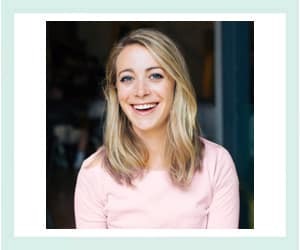 Hi Kathryn – Yay! Thanks so much for stopping by. I appreciate the nice feedback. Yay! Thanks so much for stopping by Kathryn! I really appreciate the positive feedback! I feel I have recently mastered making good macaroons. Can’t wait to try this, it looks beautiful! That’s amazing! Good for you! This batch was one of my first attempts. I still feel like I end up throwing 1/3 away but my success rate is improving! 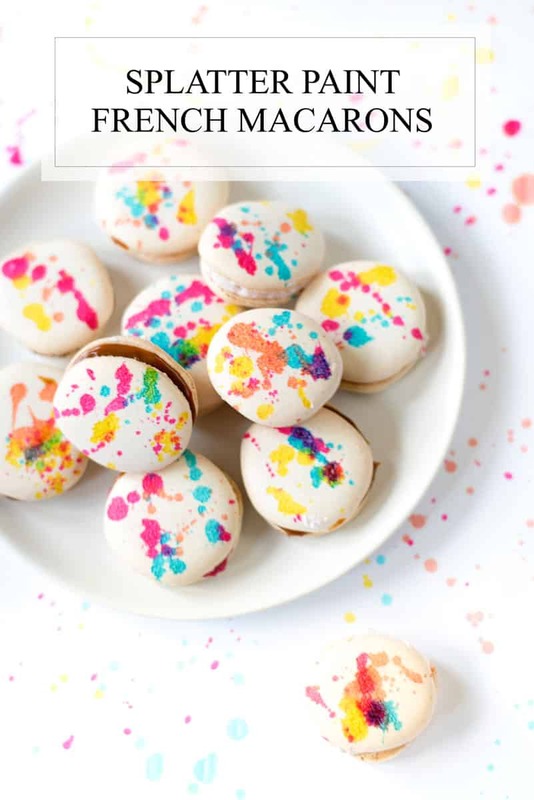 I was looking for a macaron recipe and stumbled across this, so glad I did! 🙂 They are so cute and look so delicious! Awesome! I hope you get a chance to make them. Thanks for stopping by!